Let Crossroads be your virtual factory. Throughout the production life cycle, Crossroads Industrial Services provides the highest quality solutions that serve as a scalable extension of its customers’ businesses. From contract manufacturing, assembly and other supply chain management services to just-in-time fulfillment and product packaging, Crossroads uniquely serves as a virtual factory so our customers can focus on their core competencies. 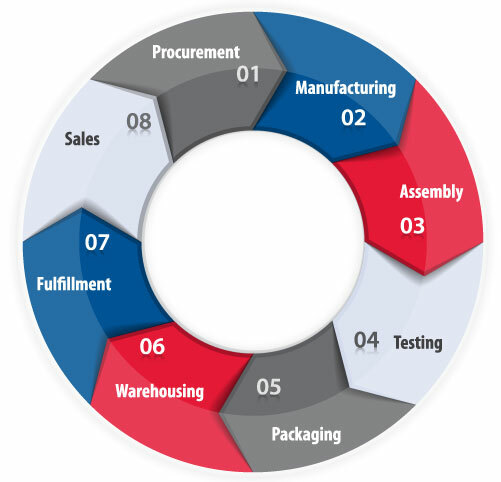 Please contact us to discuss your contract manufacturing needs. Download our complete Capabilities Statement. We work with our customers to ensure they’re successful – as their success facilitates our ability to help more people in our area. When appropriate, we even assist in the sales process by promoting finished products through our many networks. For clients we have provided logistical support for providing fulfillment and distribution of literature and products, including the process of order taking, picking, packing and shipping. Stored goods can include any raw materials, packing materials, spare parts, components, or finished goods. Crossroads has a 68,000 square foot facility, 20-foot ceilings and six loading docks. Need assistance locating the right materials for your project or even the right partners to help you get it to market? Crossroads often assists in procuring raw materials, components and parts. From bagging to shrink wrapping, custom and just-in-time contract packaging services are available to meet a full array of packaging, repackaging and shipping needs. This includes: bar coding, blister packing, 3-D labels, RFID tags, private labeling, kitting, military packaging and more. Complete custom and automated contract manufacturing services are available for clients in major industry sectors including government and military, medical device, electronic, aerospace, industrial, and automotive. Crossroads specializes in semi-automated, custom assembly of low- to mid-volume and short-run orders; rush orders also often can be accommodated. Our trained production team members monitor the integrity of your assets to detect defects and irregularities before they result in damage, non-compliance or quality issues.